Solar water heaters take advantage of solar radiation to heat water. To accomplish this they are composed of a solar collector in combination with a circulation system. 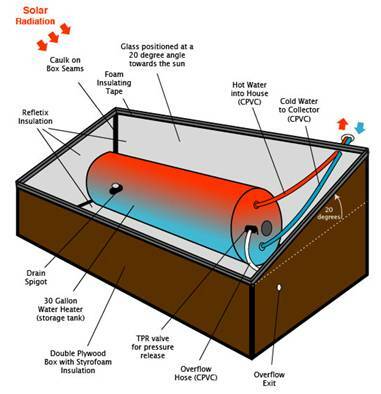 The solar collector is what heats the water, and the circulation system is what stores and circulates the water. A batch collector system is the simplest form of solar collector. It consists of a water storage tank in an insulated box, covered by a glass plate. The storage tank is painted black or with a coating that effectively transfers heat from sunlight. The inside can include a reflective surface to increase heat absorption. The insulation and glass cover trap heat from sunlight inside the box to create an oven-like environment. Batch collectors are only effective in sun and warm temperatures. 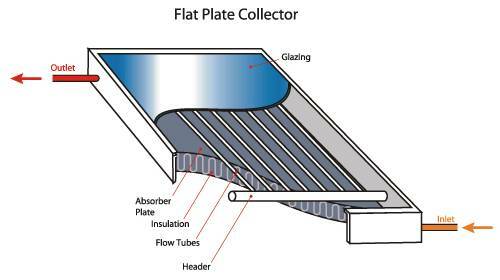 Flat plate collectors are the most common and basic type of solar heat collector. They are composed of a box that contains a layer of insulation on the sides and at the bottom. On top of the insulation is a dark colored absorber plate that has tubes attached to it. Lastly, the box has a glass or plastic cover. When the sun hits a flat plate collector it heats the absorber plate, which heats the tubes that contain a liquid, usually water. The glass or plastic cover, in combination with the insulation, trap the heat. Depending on the system, the heated water is then moved from the tubes by water pressure, gravity or a pump. The heating capabilities of a flat plate collector vary considerably with the availability of sun and the outside air temperature, i.e., they are less effective in clouds and cold temperatures than in sun and warm temperatures. Evacuated tube collectors take advantage of the condition where convection and conduction (heat transfer) cannot take place in a vacuum. This type of collector is composed of a series of evacuated glass tubes that each contain an internal pipe for liquid. The internal pipe is covered with a heat transferring coating. Sunlight passes through the evacuated glass and heats the internal pipe and the liquid. Because of the vacuum, the heating potential for this system stays relatively constant in a variety of sun and air temperature conditions, including being effective in winter. In a heat pipe, a special liquid remains in the evacuated tube section, and sends heat, through a heat exchanger, to a separate piping system that contains moving liquid. Because of its separate, replaceable components, the heat pipe system is easier to install and repair. This uses a batch collector and is the most basic type of solar water heating system. ICS systems usually use gravity and household water pressure for the water flow and are placed on walls or rooftops in sunny warmer climates. 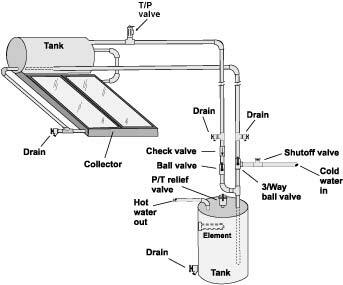 This system uses either a flat plate or evacuated tube solar collector to heat a liquid (water or antifreeze) that then moves by convection up to a water storage tank. Due to the more sophisticated solar collectors involved this type of system can be used in colder climates than the ICS system. Advantages of the passive system are its simplicity of function, ease of maintenance, lower cost, and lower likelihood of overheating. Disadvantages include lower efficiency. Advantages include greater efficiency, use in a greater range of climates and better overall control. Disadvantages include more complex installation and maintenance, increased costs and reliance on electricity.